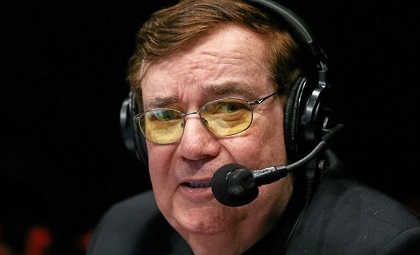 Hall of fame boxing commentator “The Colonel” Bob Sheridan has been calling boxing matches for over 40 years and has been ringside for some of the sports biggest events. I recently had a chance to speak to Bob and got his views on some of the hottest topics in the boxing. Sheridan gives his thoughts on the canceled rematch between Canelo and Golovkin and talks about Canelo’s excuse for testing positive. Bob also shares his views on Pacquiao vs. Matthysee, Manny Pacquiao chances of winning the fight and his decision not to have Freddie Roach in his corner. Here is what Bob Sheridan had to say. Robert Brown: Bob, what were your thoughts on Canelo Alvarez’s positive drug test that caused the cancellation of the Golovkin rematch? Bob Sheridan: Every athlete has to be absolutely on top of what he puts into his body, and if it’s known that the meat is bad down in Mexico, they use this drug that definitely enhances growth, it’s cheating. If you’re involved in a 100 million dollar event, you have to get out of the country in Guadalajara and go up to the United States and train where you know the meat is good. Canelo was tested twice and he failed the test, so I can’t fault the commission. For the sake of the sport and keeping the idea of testing drugs and keeping the sport on the up and up, I think boxing does a very good job. Eventually, the fight will happen, there’s too much money for it not to happen. Robert Brown: Do you believe Canelo about the meat causing the positive result? Bob Sheridan: It’s happened before. It’s known that the meat contains the drug that they use on the cattle down there in Mexico. With that said, you have to get out of there when you have a big fight coming up and go up to the States and train. You can’t take the chance, and that’s his whole team’s fault and it’s his fault too. If it was the meat, we don’t know if that’s 100% truth, that’s what Oscar De La Hoya and his crew are saying. One way or another, you find it in the blood and you have to suspend them, and that’s it. Robert Brown: With all of the turmoil that’s going on in this fight, would that change your opinion or prediction on how the fight would go? Bob Sheridan: No, the change of the date won’t make a lot of difference. Canelo is a very good fighter and it will be another close fight. I will be expecting Golovkin to win again, but there’s a lot between now and then. Golovkin has a fight on May 5th in spite of all of what’s going on, it won’t have the razzle dazzle of this fight that’s for sure. Robert Brown: Manny Pacquiao will be returning to the ring against Lucas Matthysse, what are your thoughts on this fight? Do you think it’s a dangerous fight for Manny? Bob Sheridan: I think every fight is dangerous for Manny at this stage of his career. Manny has accomplished everything he can, he’s 39 years of age and that’s a problem. No matter how gifted an athlete you are and no matter how much you train, you’re not the same as when you were 29, and that’s the case with Manny Pacquiao. Horn was the first one to expose him, even though he had a decent fight against Horn and it was a close fight throughout, Horn exposed him. With that said, I think that Matthysse is a dangerous fight, but Manny doesn’t believe that. There’s a lot of money for them to fight in Malaysia, so that’s the next move. Bob Arum’s goal is to keep Crawford undefeated, but Manny went on and did this fight on his own in Malaysia, so we’ll see what happens. The goal is for Crawford to defeat Jeff Horn and then have the big Crawford-Pacquiao fight. In order for the fight to have any luster, Pacquiao’s got to win. It’s a dangerous fight. Robert Brown: Do you think a 39 year old Pacquiao should be able to get past Lucas Matthysse? Bob Sheridan: Matthysse has the powerful right and if Manny gets caught, he’ll go, and that’s all there is about it. Every fight at this stage is dangerous when you’re fighting a world class fighter like Matthysse. It’s a dangerous fight. I don’t know what kind of money is involved in Malaysia but you can be sure there’s a lot of money involved for Manny in this one. The Pacquiao-Crawford fight will be huge is Pacquiao gets past Matthysse. Even if he doesn’t get by Matthysse, they probably will still have Crawford fight him because Pacquiao is still a huge name and a big draw here in the United States. Robert Brown: Do you think Buboy Fernandez can handle the corner for Manny? Do you think not having Freddie Roach in the corner will impact Manny’s performance? Bob Sheridan: Manny trains pretty much on his own. Freddie polishes him up when he comes to the States. Buboy really spends most of the time training Manny and they’ve been a team forever. That’s pretty much the situation, so I don’t think it will make a heck of a lot of difference at this stage. 1 Response to "Bob Sheridan: “I think every fight is dangerous for Manny Pacquiao because he’s 39 years of age and that’s a problem”"
if Horn will win against Crawford,I believe he also won in his fight with Pacquiao.